Minster's Courtney Prenger drives against Versailles' Lindsey Winner during a Midwest Athletic Conference game on Thursday in Minster. Prenger scored a season-high 27 points. Minster’s Janae Hoying drives against Versailles’ Caitlin McEldowney during a Midwest Athletic Conference game on Thursday in Minster. 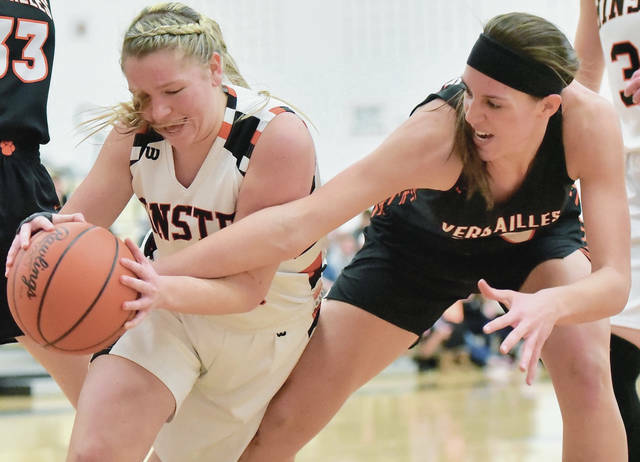 Minster’s Courtney Earnst, left, and Versailles’ Lindsey Winner go for a loose ball during a Midwest Athletic Conference game on Thursday in Minster. Minster's Ivy Wolf shoots as Versailles' Liz Watren defends during a Midwest Athletic Conference game on Thursday in Minster. Minster's Ivy Wolf shoots as Versailles' Lindsey Winner defends during a Midwest Athletic Conference game on Thursday in Minster. Minster's Demaris Wolf drives as Versailles' Lindsey Winner reaches for the ball during a Midwest Athletic Conference game on Thursday in Minster. 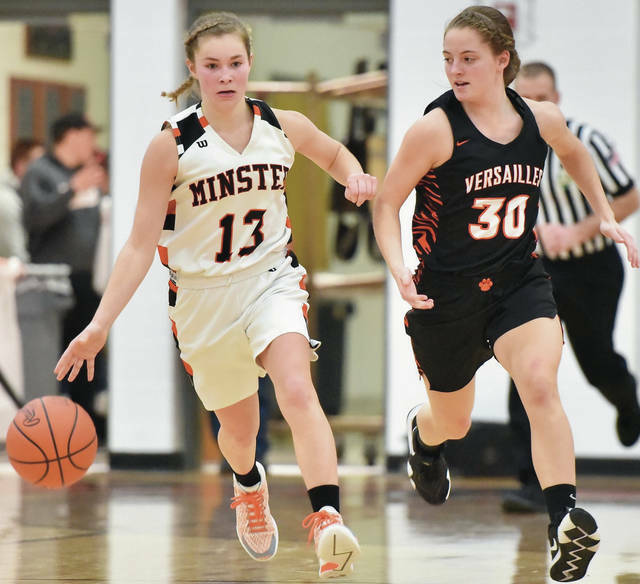 Minster's Courtney Prenger drives as Versailles' Lindsey Winner and Liz Watren defend during a Midwest Athletic Conference game on Thursday in Minster. Prenger scored a season-high 27 points. Minster's Courtney Prenger and Versailles' Caitlin McEldowney reach for a loose ball during a Midwest Athletic Conference game on Thursday in Minster. Minster's Demaris Wolf shoots during a Midwest Athletic Conference game against Versailles on Thursday in Minster. Minster's Courtney Prenger looks to get past Versailles' Lindsey Winner during a Midwest Athletic Conference game on Thursday in Minster. Minster's Janae Hoying looks to get around Versailles' Savannah Toner during a Midwest Athletic Conference game on Thursday in Minster. Minster's Janae Hoying drives as Versailles' Caitlyn Luthman follows during a Midwest Athletic Conference game on Thursday in Minster. Minster’s Courtney Prenger prepares to shoot while guarded by Versailles’ Savannah Toner and Brooke Stonebraker during a Midwest Athletic Conference game on Thursday in Minster. Prenger scored a season-high 27 points. View more photos from Versailles at Minster here. 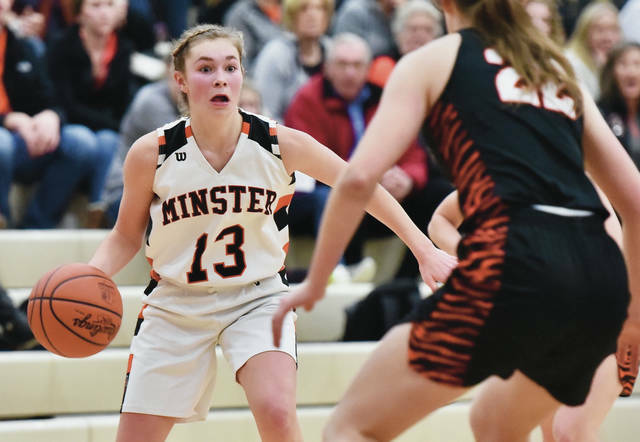 MINSTER — Courtney Prenger had struggled to score inside against Versailles’ tall post players and had several shots blocked by 6-foot-2 junior forward Lindsey Winner. Then Prenger nearly single-handedly took over doing what coach Mike Wiss said is her impression of former Seattle SuperSonic Jack Sikma, a 6-11 post player. 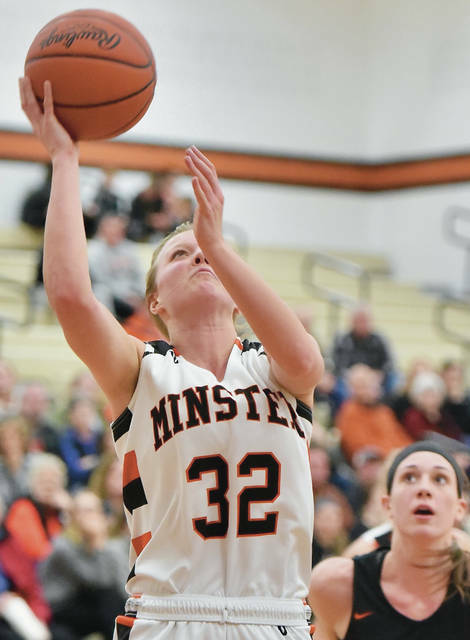 Prenger scored 15 points during an 18-0 run by Minster, which helped the squad turn a one-point deficit into an insurmountable lead in a 52-30 victory over the Tigers in a Midwest Athletic Conference showdown on Thursday. 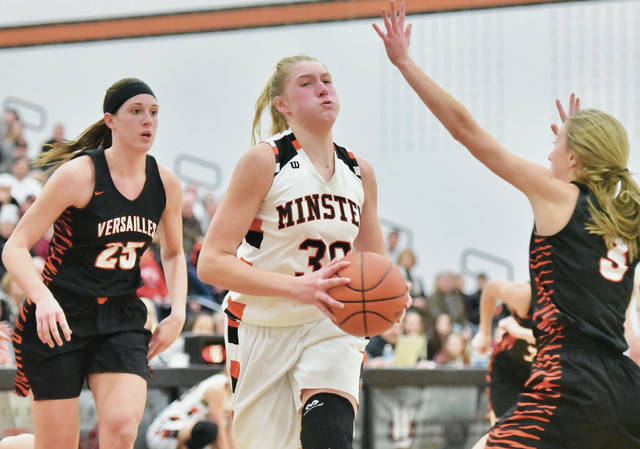 Prenger, a 6-1 Xavier commit, led Minster with a season-high 27 points. She entered the game averaging 10 points per game. 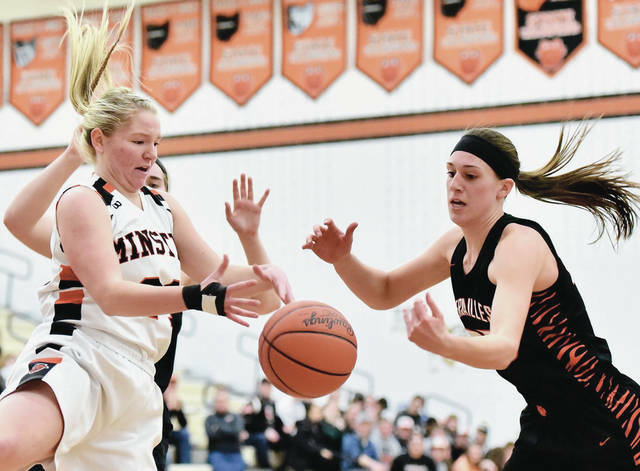 The victory gave Minster (17-1, 7-0 MAC) sole control over first place in the MAC. Versailles (13-5) was previously unbeaten to in MAC play but dropped to 7-1 with the loss. It was the second tough loss this week for the Tigers, which dropped a close contest at West Liberty-Salem on Tuesday. Minster led 22-19 at halftime but Versailles grabbed the lead midway through the third. 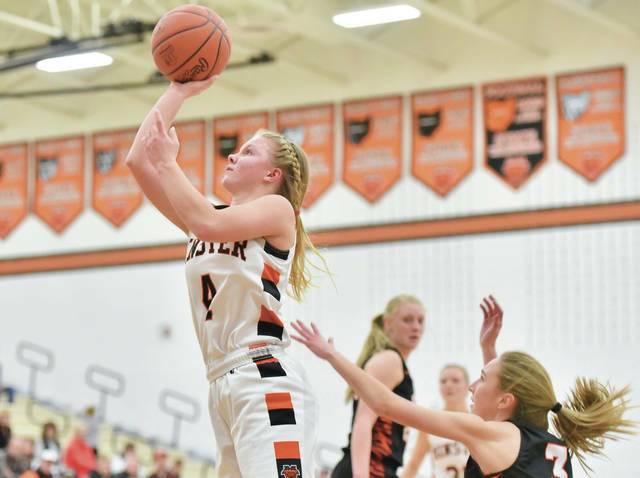 Prenger started the quarter with a basket to put Minster ahead by five points, but Hannah Barga, Kelsey Custenborder and Liz Ording scored consecutive baskets in the paint to put the Tigers on top 26-25 with 4:35 left. The Tigers didn’t score the rest of the quarter, though, and Prenger took over. Prenger scored inside with 4:06 left to put the Wildcats up, then Janae Hoying made a 3 from the left wing 35 seconds later to increase the advantage to four. Prenger scored five more baskets before the end of the quarter, including a jump shot from just inside the 3-point line in the left corner with 14 seconds left to boost the lead to 39-25. Prenger made 1-of-2 free throws and then added another basket in the paint to push the advantage to 42-25. 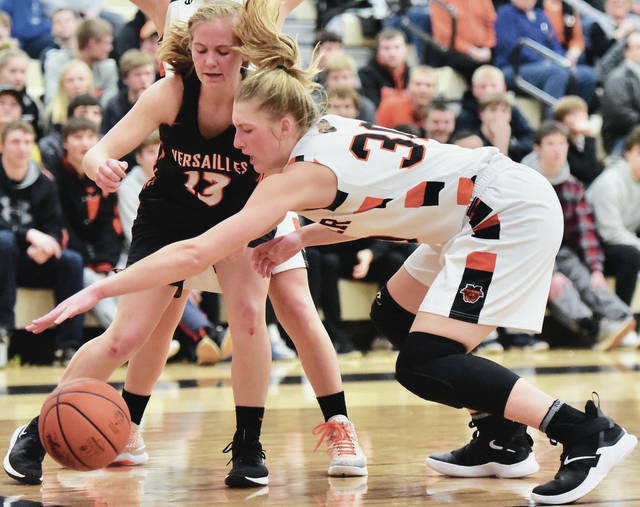 Ording broke Versailles’ scoreless streak with a free throw with 6:31 left. 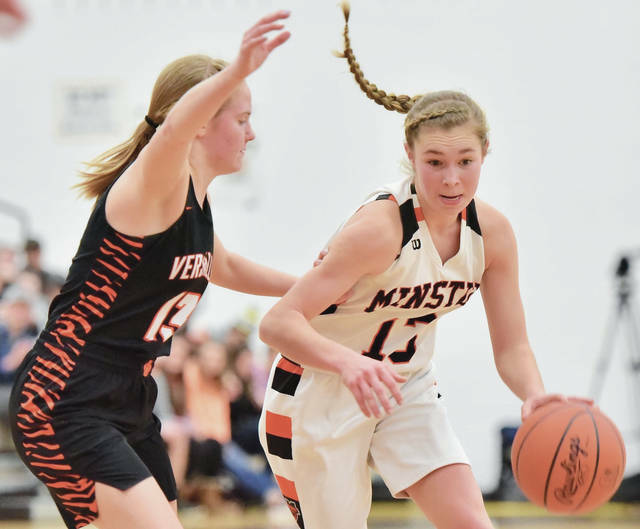 Kelsey Custenborder scored the first basket of the game but Minster scored the next eight points — including 3-pointers by Ivy and Demaris Wolf. Versailles responded with a 6-2 run to pull within 10-8 but Minster stretched its lead to 14-11 by the end of the first. Demaris Wolf opened the third quarter with a 3-pointer to push Minster’s lead to 17-11, but Versailles quickly got back in it. Winner made a put-back in the paint with 4:53 left, then Custenborder split a pair of free throws and Caitlin McEldowney made two foul shots with 3:04 left to cut the gap to 17-16. The teams traded points until the final seconds of the quarter. Prenger knocked the ball away from a Versailles player but had to chase after it and save it from going out-of-bounds under Minster’s basket. She threw the ball behind her back, and Jessica Falk caught it and laid it off the glass with about 10 seconds left to give the Wildcats a three-point halftime lead. Ivy Wolf finished with 12 points. Ording led Versailles with nine. Minster travels to Ottoville next Monday for a rematch of last season’s Division IV state title game. The Wildcats beat Ottoville 63-48 after scoring the game’s last 16 points. Versailles will host neighbor Russia on Saturday. 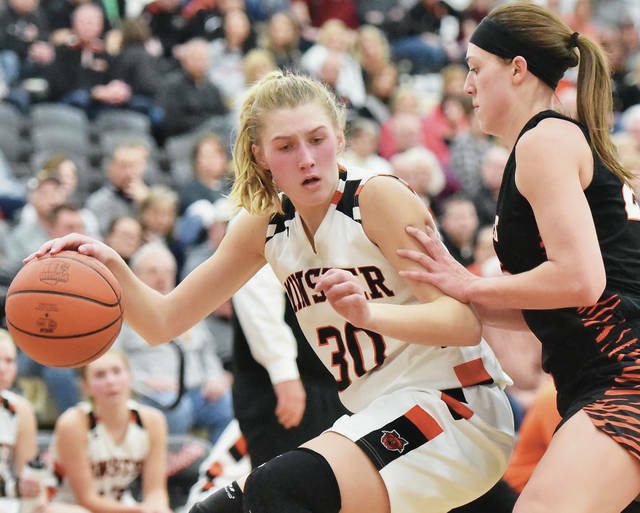 Minster’s Courtney Prenger drives against Versailles’ Lindsey Winner during a Midwest Athletic Conference game on Thursday in Minster. Prenger scored a season-high 27 points. 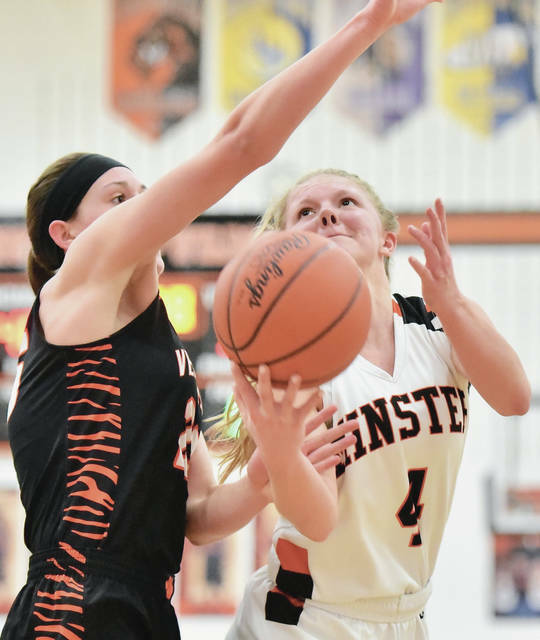 https://www.sidneydailynews.com/wp-content/uploads/sites/47/2019/01/web1_vers25-1.jpgMinster’s Courtney Prenger drives against Versailles’ Lindsey Winner during a Midwest Athletic Conference game on Thursday in Minster. Prenger scored a season-high 27 points. Minster’s Ivy Wolf shoots as Versailles’ Liz Watren defends during a Midwest Athletic Conference game on Thursday in Minster. Minster’s Ivy Wolf shoots as Versailles’ Lindsey Winner defends during a Midwest Athletic Conference game on Thursday in Minster. Minster’s Demaris Wolf drives as Versailles’ Lindsey Winner reaches for the ball during a Midwest Athletic Conference game on Thursday in Minster. 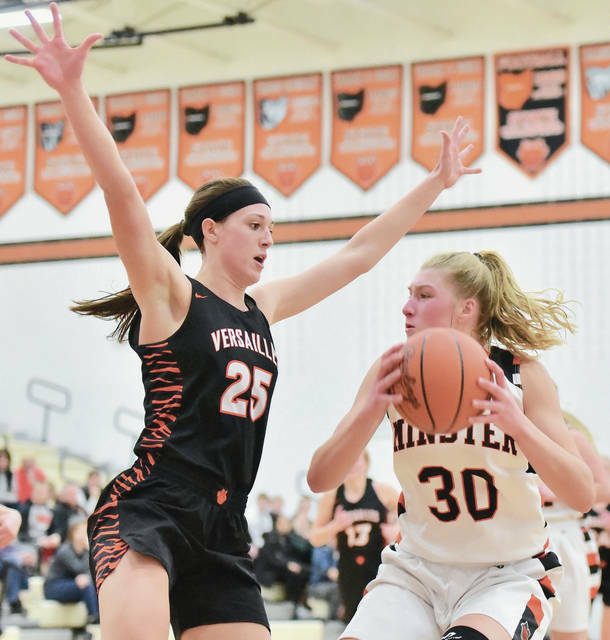 Minster’s Courtney Prenger drives as Versailles’ Lindsey Winner and Liz Watren defend during a Midwest Athletic Conference game on Thursday in Minster. Prenger scored a season-high 27 points. Minster’s Courtney Prenger and Versailles’ Caitlin McEldowney reach for a loose ball during a Midwest Athletic Conference game on Thursday in Minster. Minster’s Demaris Wolf shoots during a Midwest Athletic Conference game against Versailles on Thursday in Minster. Minster’s Courtney Prenger looks to get past Versailles’ Lindsey Winner during a Midwest Athletic Conference game on Thursday in Minster. Minster’s Janae Hoying looks to get around Versailles’ Savannah Toner during a Midwest Athletic Conference game on Thursday in Minster. Minster’s Janae Hoying drives as Versailles’ Caitlyn Luthman follows during a Midwest Athletic Conference game on Thursday in Minster. 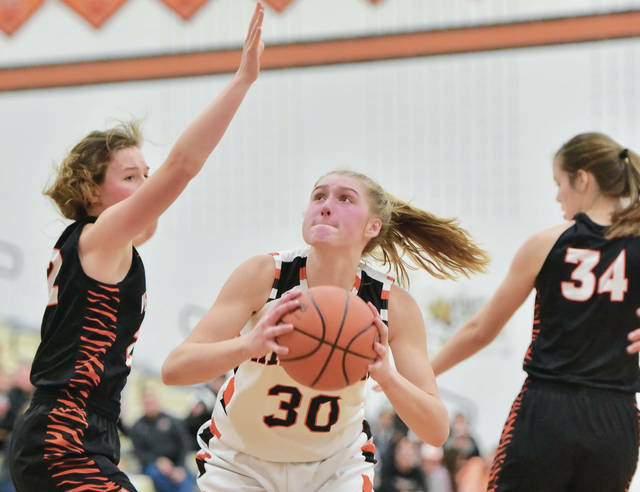 This entry was tagged basketball, Courtney Prenger, girls, girls basketball, high school, Ivy Wolf, Jackie Stonebraker, Janae Hoying, Liz Ording, MAC, Midwest Athletic Conference, Mike Wiss, minster, Tigers, versailles, Wildcats. Bookmark the permalink.